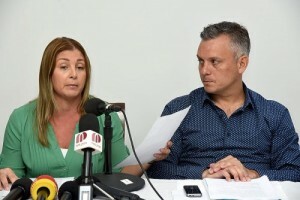 WILLEMSTAD - Former Prime Minister of Curaçao Gerrit Schotte and his wife Cicely van der Dijs have to appear before the court on June 12 and 13 for their appeal case. The court hearing of the Babel case will take place during these two days. In this case, Schotte was convicted in March 2016 for three years in prison and for five years he cannot be a candidate for parliamentary elections. Van der Dijs was sentenced to eighteen months of which nine months were conditional with two years’ probation. According to the judge in the Court of First Instance, Schotte was guilty of corruption, money laundering and forgery before and during his term as Prime Minister between 2010 and 2012. Because he appealed his case, Schotte was able to remain in parliament after his conviction. At the elections of April 28 this year, his party MFK received 5 out of 21 seats in parliament. In April and May of this year, his party led an interim government in which he had the ropes, but because of the conviction, he was unable to hold a ministerial post. For the appeal, Schotte has hired Dutch lawyer Geert-Jan Knoops and his team. Schotte recently announced that he is prepared to speak and give details about the case during the hearing. In the first process, he largely relied on his silence.